Prince the white Mauzer (Maltese / Miniature Schnauzer mix breed dog) at 1 year old—"This is our Maltese/Mini-Schnauzer mix. He is almost a year old in this picture. He has been such a fun dog. He is very playful and always wants to play with a ball or toy. He is also very cuddly and wants to sit/lie right where we are. His one downfall is he gets super friendly around strangers, especially children, and wants to jump up and lick them. He also barks at other dogs but its a friendly barking--he wants to play! He has been a wonderful dog around our 3 year old. Mauzers would be very fun family dogs, and also great for a retired couple or a single person. Small, non-shedding." 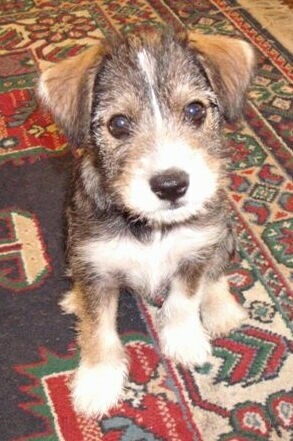 Abby the Chizer (Chihuahua / Miniature Schnauzer mix breed dog) as a puppy at 3 months old—"Abby is sweet and lovable, also smart and trainable. I would have another one in a heartbeat." 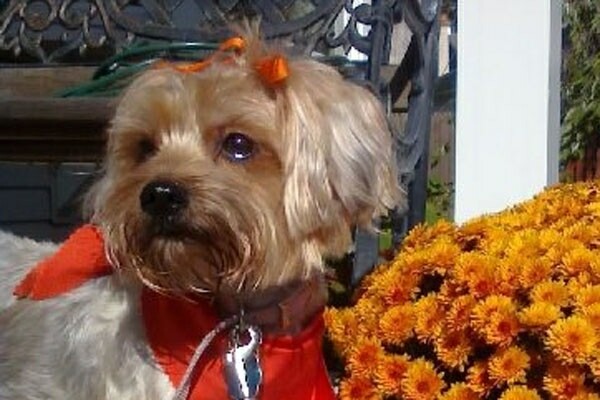 Lacey the Snorkie (Yorkie / Miniature Schnauzer mix breed dog) at 2 years old—"Lacey has a very mild temperament. She is smart and loves to cuddle. She does not require much exercise. Very easy to litter train, a perfect dog for an apartment or elderly person."